NEW LIFE: over 150 Ramadan traders in Jalan Sisi add vibrance and colour to the evenings in town. 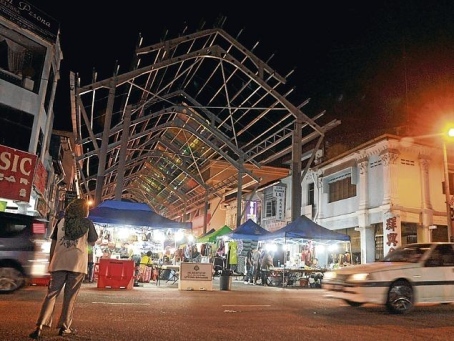 MUAR: THE Muar district council (MPM) has developed a night bazaar that has changed the once-quiet evenings in town. The bazaar in Jalan Sisi here is buzzing every night for the entire month of Ramadan. The MPM has transformed the stretch of road into a covered lighted area by taking the famed Petaling Street of Kuala Lumpur as a model. Proper walking space between the trading booths has become a bonus for visitors, who have come back regularly to shop since the bazaar opened on July 27. The bazaar houses 162 traders selling products and services such as motorcycle accessories, clothes, children’s toys, fragrances, wedding clothes and massages. Trader Azrul Lias said he was proud the bazaar had become the heartbeat of Muar town at night. “The bazaar is definitely a breath of fresh air for both traders and visitors in Muar,” said the 34-year-old. As a trader, Azrul said he appreciated the MPM’s efforts to help the traders increase their sales and to add colour to the evenings in Muar. An MPM spokesman said the bazaar’s current operating hours were from 5pm to 2am. He said for Ramadan and Aidilfitri, the council has allowed the trading hours to be from 5pm to 5am tomorrow and Saturday.